A meeting - the “Days of Communion” - took place in Katowice-Koszutka during the weekend of 10-12 October and gathered young Poles running the preparation points for this year’s European meeting. 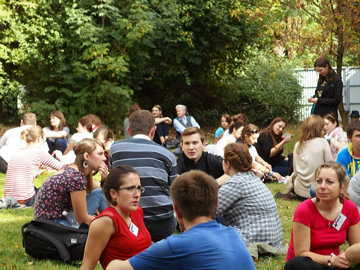 The Oblate parish hosted about 80 young people from different regions of Poland. As some local people also took part, the overall number of participants was around 100. 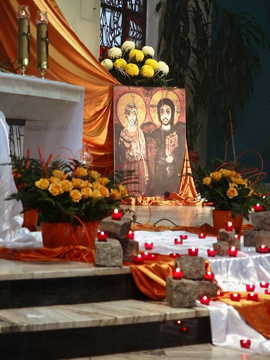 The young people in Katowice were accompanied by the words form the letter by brother Alois “Searching for the visible communion among all who love Christ.” They took part in workshops, they had a tour of Katowice, they talked about the status of preparations that had already started both in Prague and in Poland and, of course, they prayed together. 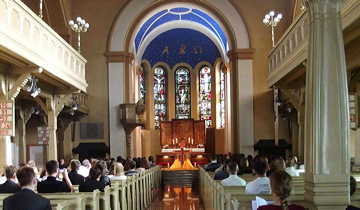 On Saturday afternoon, the participants of the meeting were invited for a common prayer to the Lutheran church, where the Lutheran youth groups also arrived. The Days of Communion culminated in the evening prayer on Saturday, joined by Archbishop Wiktor Skworc and the Lutheran bishop Marian Niemiec. Reminiscing about his contacts with the Taizé community, Archbishop Skworc said: “We were blessed with the opportunity to meet the great prophets of the 20th and the 21th centuries: John Paul II and Brother Roger. Both were friends of God and friends of people. And they built their communion with God and people primarily in prayer”. The preparation point in Łuków has designed a lesson on Taizé and European meetings to be delivered at the classes of religious education at schools. We managed to visit one school last year, and this year we are planning to cover all the secondary schools in our town. But in order to share information, we need to obtain it ourselves, that’s why four of us set off for the Days of Communion in Katowice. We wanted to experience community for a couple of days, pray together and learn about the details of preparations for the Prague meeting. It was a very important weekend for us. We had an opportunity to hear how other preparation points work in Poland. We talked a lot on our way back and decided that we don’t want to be limited to our own town, but we will try and reach out to other places. We are planning to organize prayers with Taizé chants in a number of churches. Schools are very open to our initiative, young people want to listen, they are searching for something new. In order to reach them, we have created a Facebook page and a blog. It is wonderful that Taizé does not only mean prayer, but also (and maybe first and foremost?) meeting other people, oneself and God. In a small group, we discussed the question “What was my experience of friendship during the last year?” So many answers crossed my mind! Yet, if I were asked the question today, I would reply: the meeting in Katowice, certain people I met there and conversations with them. Grateful for the time spent there, I say to myself: see you at the preparation points meeting in Krakow, see you at the European meeting and in Taizé itself. We were happy to see so many people arrive at the meeting of the preparation points for Prague. It was an organizational challenge for us, but also an experience of wonderful hospitality. We received a lot of support from the Oblate Fathers, who helped us with the preparations and reserved their entire catechetical centre for the participants of the meeting (a real challenge for the parish). For us, for our town, it was a real festival of unity and communion.